Having reached a stage where I am happy with the general structure of the two core chassis pieces I thought it time for an update. 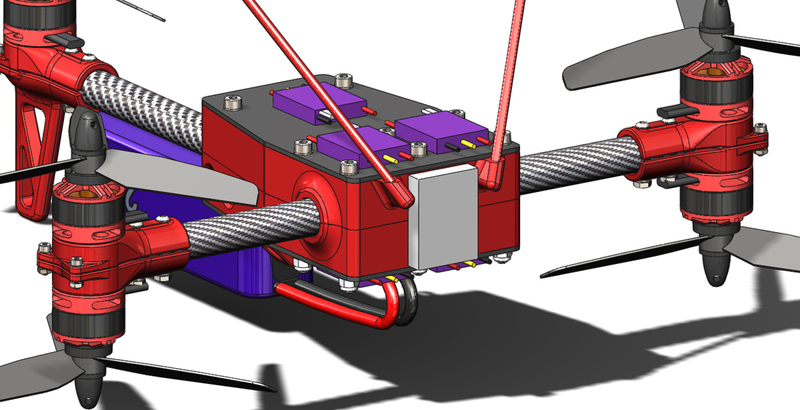 Shown here is the lower half of the structure with the servo module nestled in the middle. 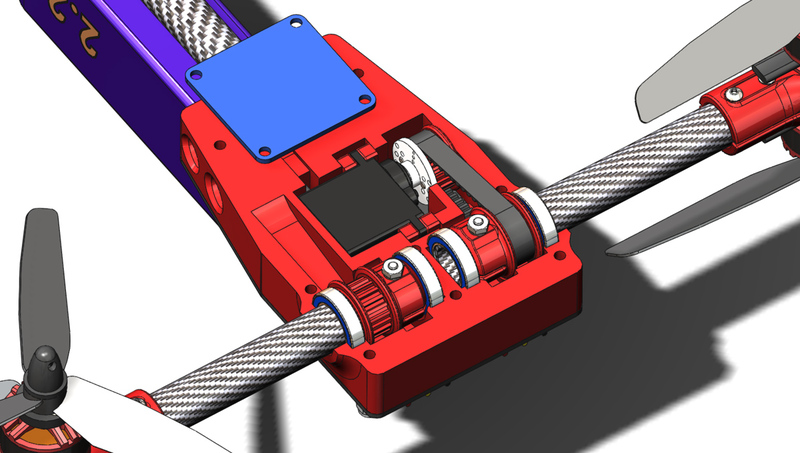 I have not yet added the belt tensioning mechanism but the intention is for a screw to be inserted through the front face of the chassis to push on the servo carrier. This is how the lower chassis piece appears in isolation. There is still plenty of refinement to follow including weight reduction (only where significant gains can be made given that this is primarily a proof of concept) and rounding of sharp corners. The upper half is a direct copy of this piece for the bearing supports and servo mounting but the rear end changes to make space for the flight controller. Whilst the flight controller was on my mind a made a point of checking pin locations on the intended board (The RMRC Seriously Dodo Flight Controller). 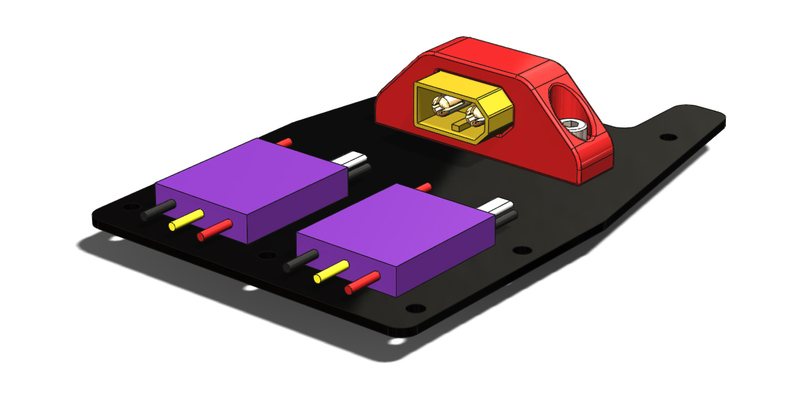 My plan of attack is to mount the board with the USB connector facing rearward and then install 90° pins backwards on to the outputs, that is to say so that the connectors and wires will run across the board rather than away from it as would usually be the case. I have also attended to the positioning of the receiver I will be using, the FrSky X4R (my RX of choice due to its S.Bus and SmartPort interfaces). 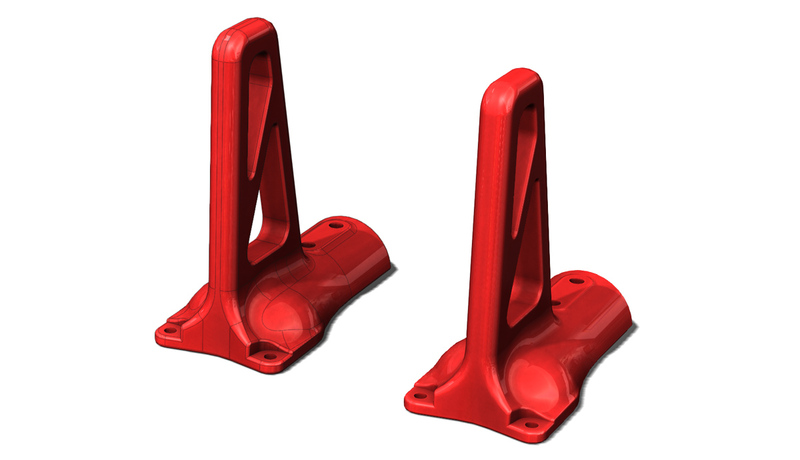 As shown here it will be on the front of the chassis (behind the nose cone). Whilst working on the chassis pieces I also added mounts for the antenna. By no means are they optimised for diversity, I am not expecting reception issues given I will only be flying this with direct line of sight. 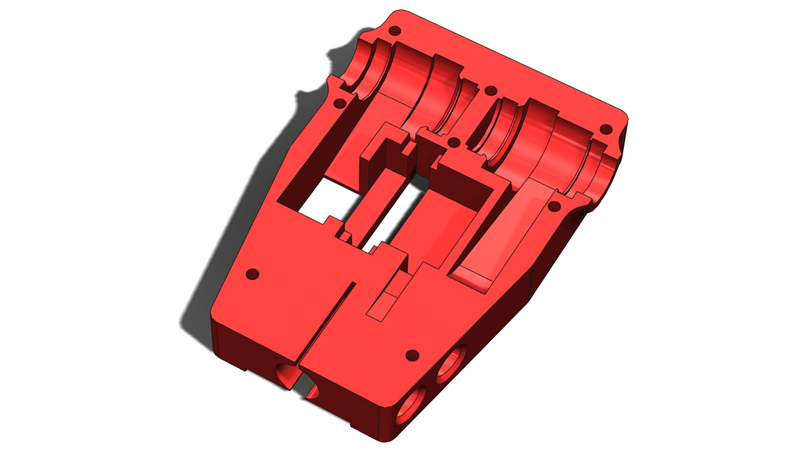 There are still a lot of fine details to attend to but hopefully with some time away from work during the holiday period I will be able to get all the 3D printed parts buttoned down and out for printing (no printer in house unfortunately). So far as seen in the image below the external shape is mostly in place. Internally the bearing support area is mostly sorted out but the servo mounting is not. As such I will hold on images of internal detail until that is in a ‘working’ state. Also visible in the image is the rear boom clamping. A slotted hole penetrates the rear of the bottom chassis structure which is then clamped through the two holes in the side. Currently the supporting structure around this area is very deep so the clamping may not be particularly effective (i.e. structure may be to stiff), I will need to reassess. 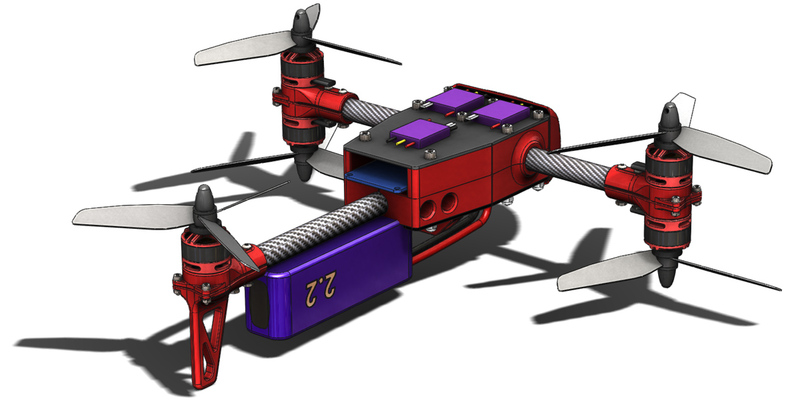 There is further external detail to work out around the flight controller mounting and battery. You may also note that I have changed the propellers. Crucially to a 5″ diameter but also shown here with 3 blades. 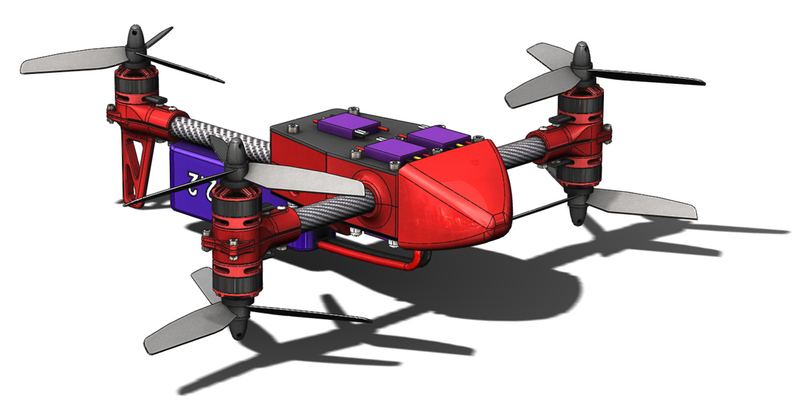 The data I have seen suggests that a 5×4 propellor provides similar thrust to a 6×3 propellor (at the expense of some efficiency) and my experience with 5×4 props on the Spidex 220 has made me happy to consider this an alternative. 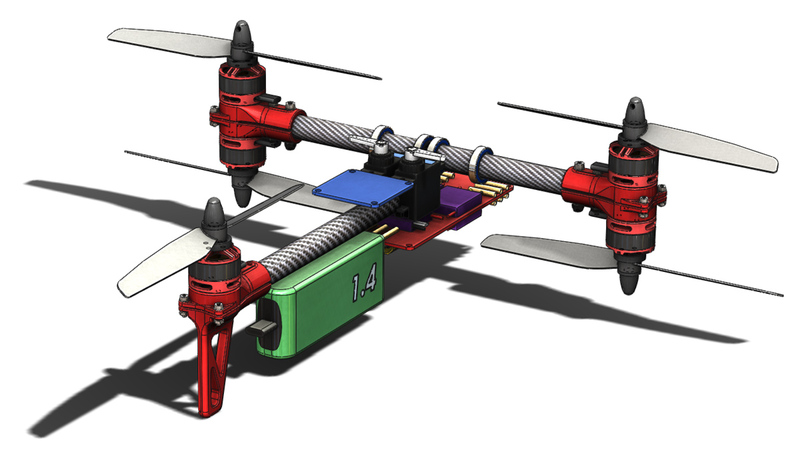 I have not yet reduced the frame size so a 6″ propellor is still an option. Also added is a front nose cone, primarily for aesthetic reasons at this point but it will surely improve the aerodynamics somewhat too. It is currently only a hollow place holder. The intention is to make it a snap fit on to the front of the chassis structures. That will be another learning experience and experiment in 3D printing to go along with everything else experimental on this airframe. To facilitate the adjustment of the belt tension I have added a slider carriage of sorts to the servos which will fit into slots on the chassis structures. I’ve yet to add the tooth detail to the pulleys for 3D printing. The final little detail to show off today is a holder for an XT60 socket. I decided that having the connector flat will mean less wire hanging low off the bottom of the craft. I’ve been spending plenty of time fiddling with and flying the VersaCopter since getting it airborne so progress on this project has slowed somewhat. I did put a little bit of time into it today. Firstly I decided to bump the motor spacing out to 275mm, up from 250mm, that is to say that the centre of all the motors fall within a 275mm circle. Hopefully this will allow me to get the larger battery to work. As can be seen below it is substantially larger. I also created a first draft of the boom control arms. 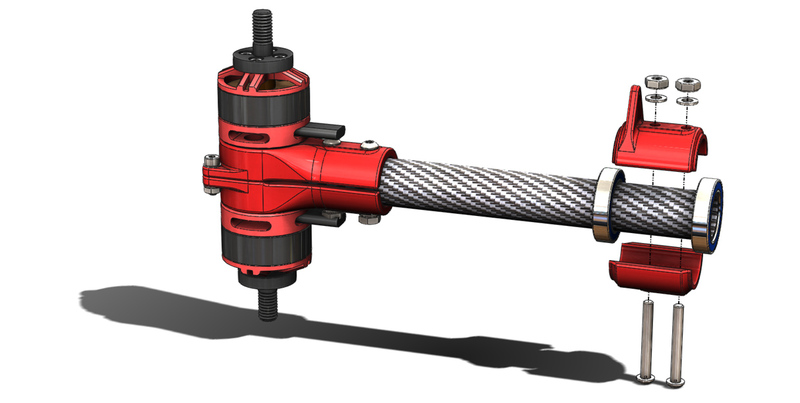 This part serves a dual purpose, it is the bearing spacer and the arm for controlling the rotation of the booms. My intention is to make the bearing carrier an interference fit along the axis of the boom to keep everything tight through preload. This necessitates the bearing spacer and merging that part into the control arm is a weight efficient approach. My primary concern currently is that the arm itself looks rather small and possibly not strong enough. I have also not looked at the movement of the arm to check for collisions. These will both be assessed down the track. 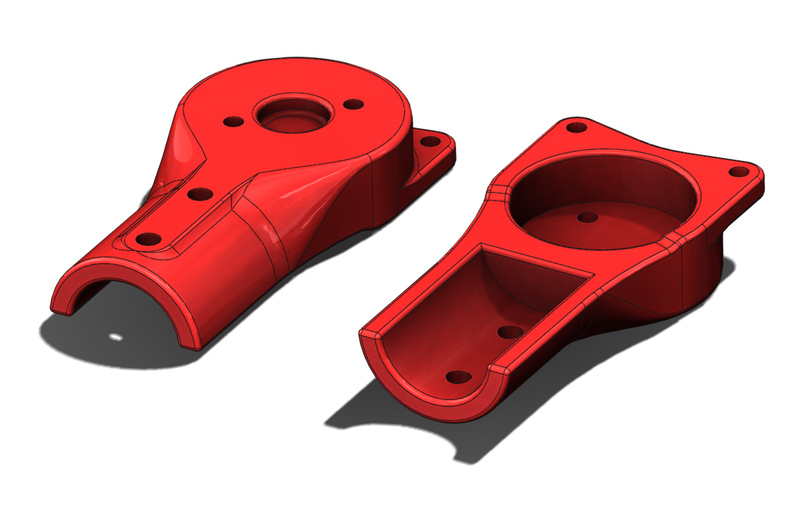 Sometimes when working with SolidWorks I find myself spending a lot of time making sure that the model is spot on down to the last edge or vertex rather than considering the role of the part in the project at large. Today was one such time, I have been working on the rear motor mount. 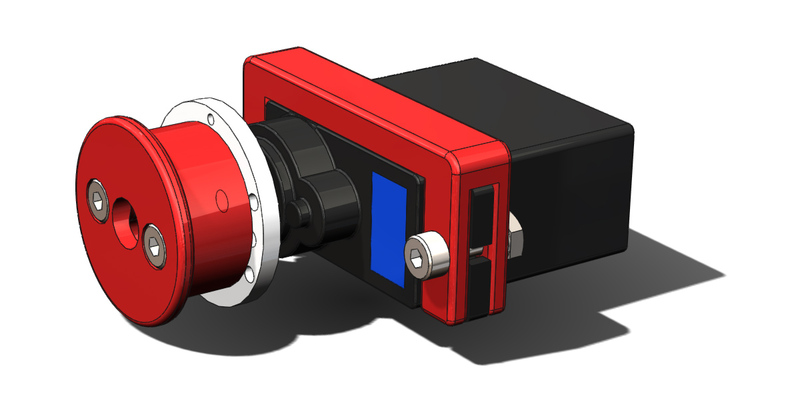 I will make my point about CAD shortly but first some background on the rear motor mounting. 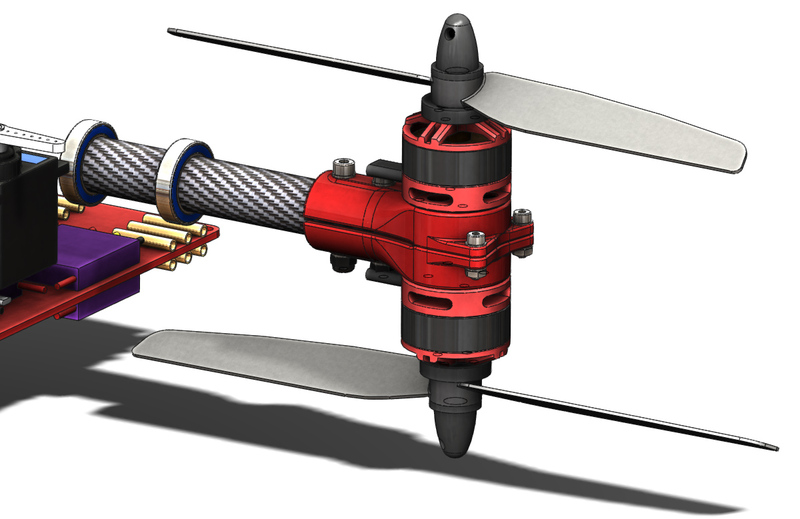 One of the hangups that I have had getting a start on this part of the design was trying to decide exactly what level I would like to have the motor mounted at and hence at what level the propellor would be spinning. The reason for this indecision is tied to the the Mk. 1 prototype. When flying forward the Mk. 1 would pitch nose up. My suspicion is that the center of drag in a vertical sense is mostly influenced by the spinning propellers rather than the frame. Given that the centre of forward thrust is level with the frame and not the propellers a pitch moment is created causing the rotation. The logical progression from this assumption would be to get the centre of thrust in line with the level of the propellers and test again. For this Mk. 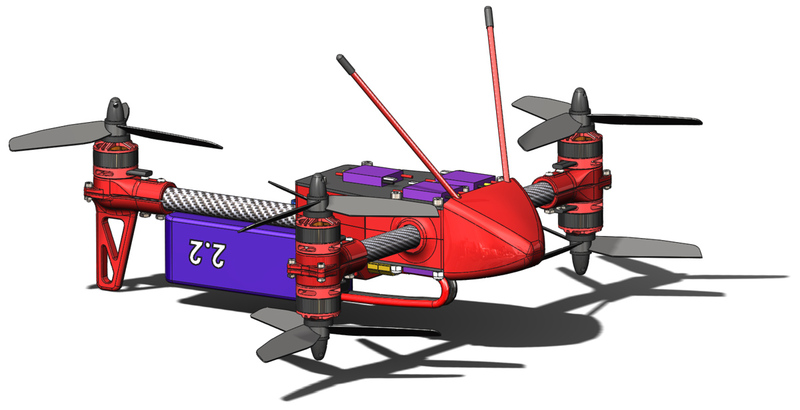 2 design that would mean getting the rear propeller level with the front boom. That however introduces its own set of problems mostly to do with finding space for all the components, particularly the battery. 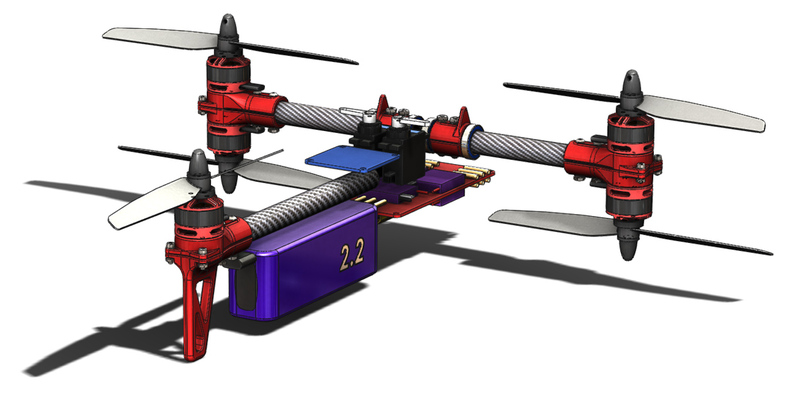 For now I have decided to use the same motor mounting as the forward motors but with a rear specific lower part incorporating a landing foot. Show above is the design I am happy with for now, on the left with the surface lines shown and on the right without to give a clean look at the finished surfaces. Given that the project is still in a conceptual layout stage I have invested far more time in to it than was really necessary. The basic form for the part took only a few minutes work, keep the same profile outline as the motor mount, add a leg to the bottom. That would have served the need completely at this point. However I sunk significantly more time in to several iterations using different modeling approaches to arrive at what is seen here with fully resolved smooth surfaces. If someone was paying me to develop this project with expectations of efficiency then this would be a fairly irresponsible approach. As the design progresses there is a reasonable chance that this part may need to change and that that change could require significant rework of the model. As a pleasure driven pursuit though I can afford the time to indulge in the modeling, I find a certain satisfaction from the process akin to that derived from assembling a model kit or just generally putting things together. The next step is going to be having another look at the battery placement and power distribution. 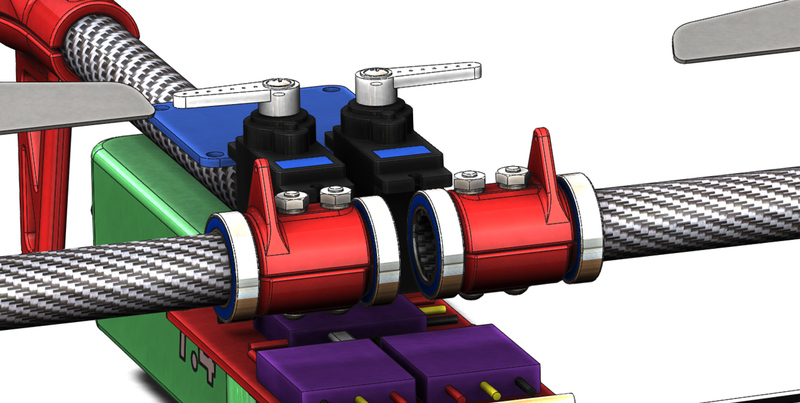 I am not happy with the positioning of the bullet connectors for the motors with respect to the arms and the battery connector and wiring is not going to work as shown here.